← Where to go in Corsica? This sister island to Corsica is less dramatic, but more colorful. The shrubby plants are brightly colored with warm hues. While Corsica is French, Sardinia is Italian. They both dream of independence! Sardinia raises sheep on their mountains while Corsica raises goats. So we find sheeps milk cheese in Sardinia. Sardinia was also under constant attack like Corsica, so the people also moved away from the coasts and ate the wild boar, but no fish. 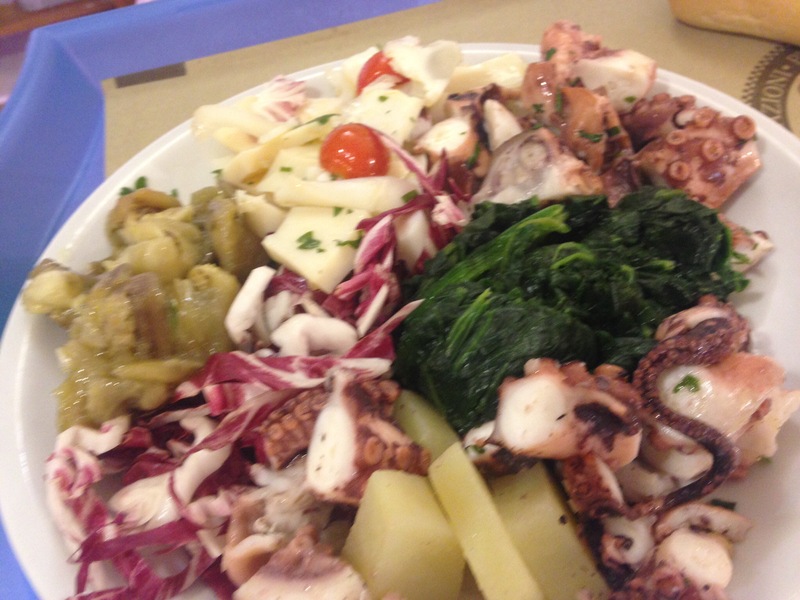 Today seafood is plentiful in the coastal towns, but not the mountain villages. We spent 12 days in Bosa, a seaside city on the Temo River which flows into the sea. 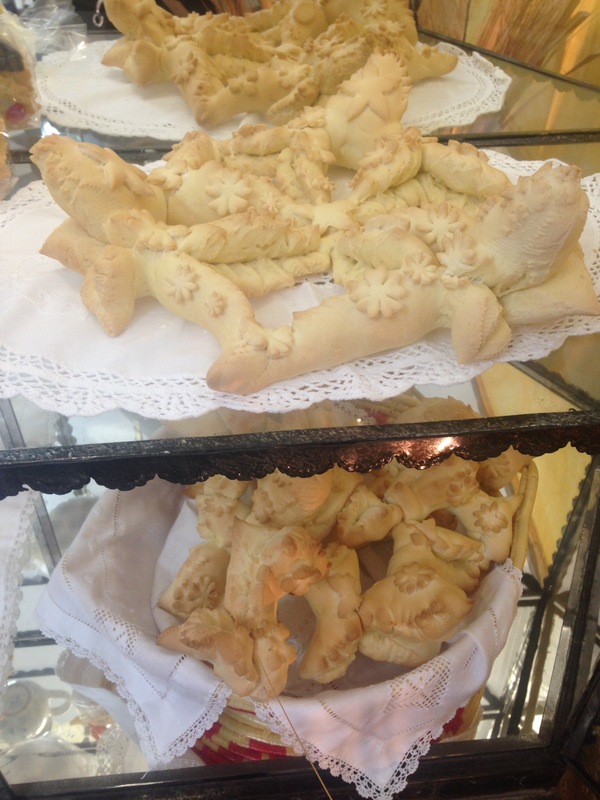 Here are some of the foods we tried in Bosa and nearby villages. 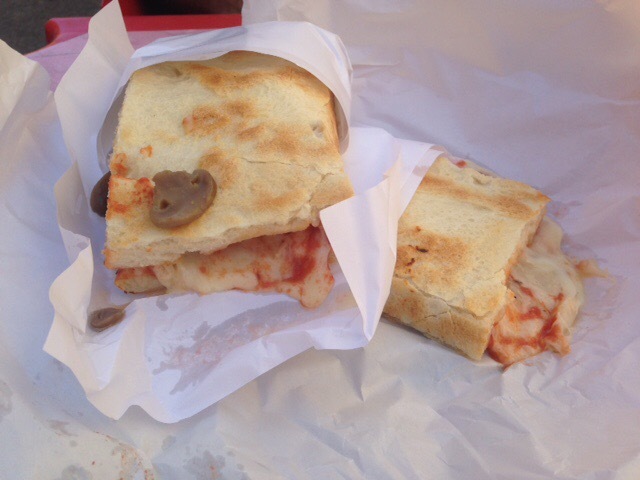 We picked up this panini at a roadside deli next to a gas station out in the middle of nowhere. 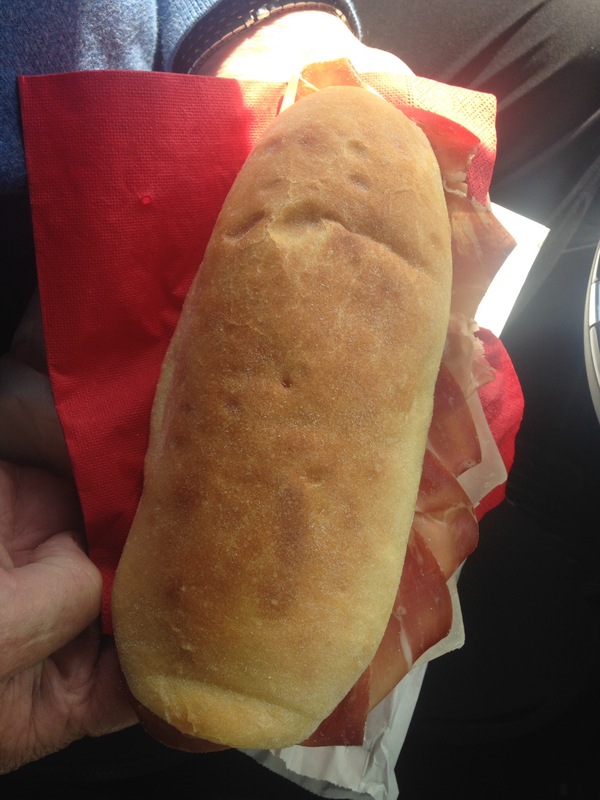 The bread was fresh and crispy and the sandwich was filled with prosciutto and sliced mild cheese. Very fresh and flavorful! About 8 men of all ages were sitting there drinking beer in the afternoon. Bosa is famous for its “cru” wine of Malvasia. Cru means this wine can only be made in this region with the Malvasia grapes. 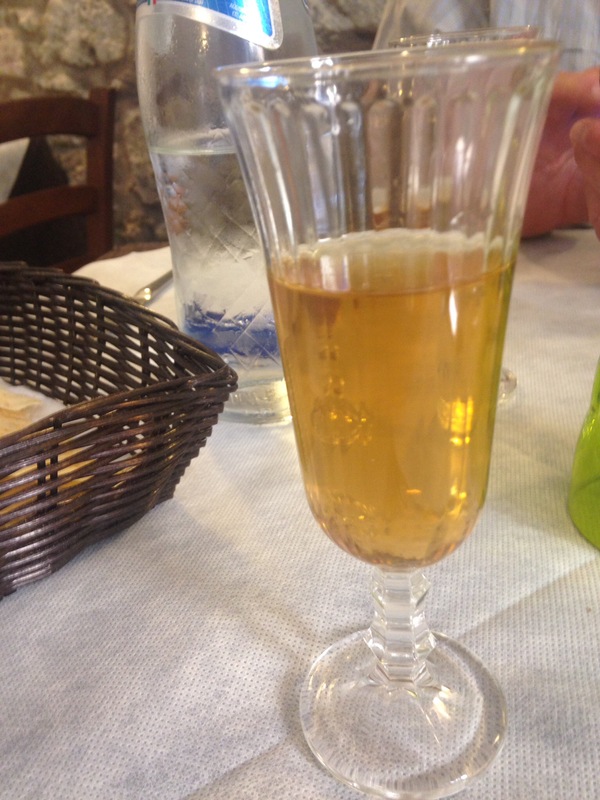 It is a light amber color and on the sweet side. This was served as an aperitif on the house! 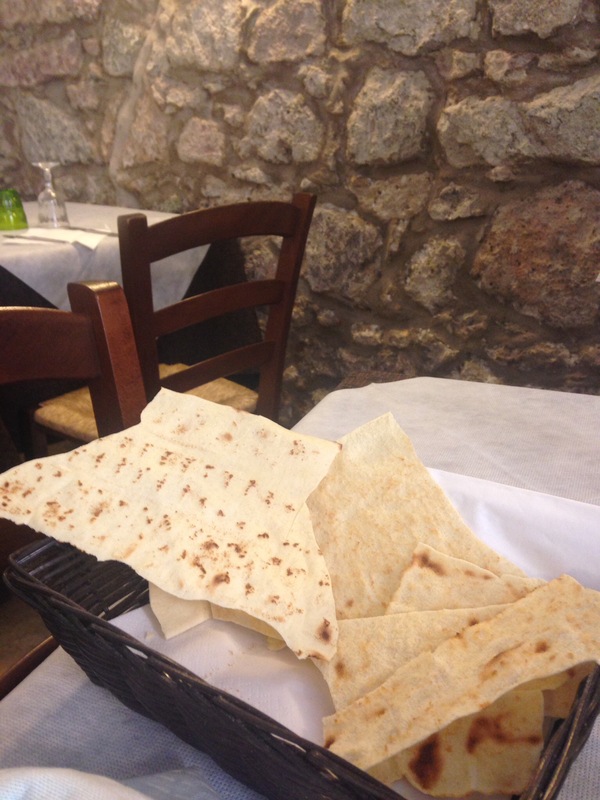 This is the ancient and still commanly used bread of Sardinia, carte de musica. This crisp and paper thin cracker like bread makes music when you break it! 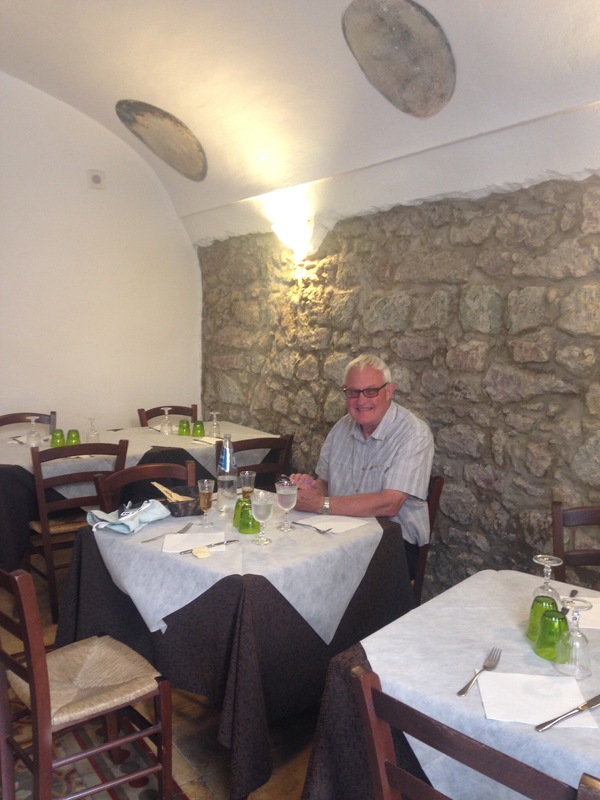 This is Trattoria Biancospino where we ate this delish lunch. It was one of the best meals of our trip! The buildings of Bosa date to the 14th and 15th centuries. Many remodeling designs expose the old stonework. 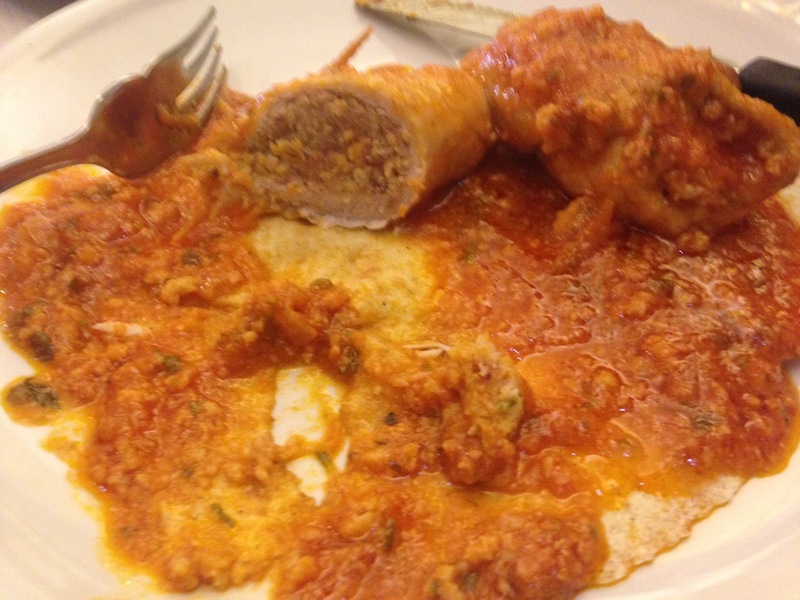 Now that we are in Italy, we see the primo and secondo courses. 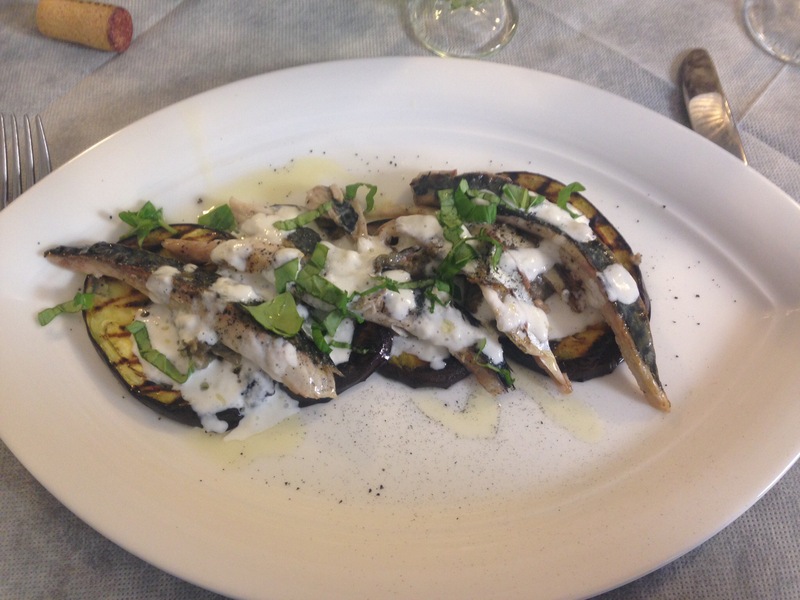 This is a primo of grilled eggplant topped with puréed eggplant and then strips of grilled mackerel and topped with a thin mozzarella cream sauce and fresh basil. Magnificent! This primo is 1 large homemade ravioli filled with Gorgonzola and topped with sautéed artichoke, radicchio and mushrooms with a balsamic sauce. 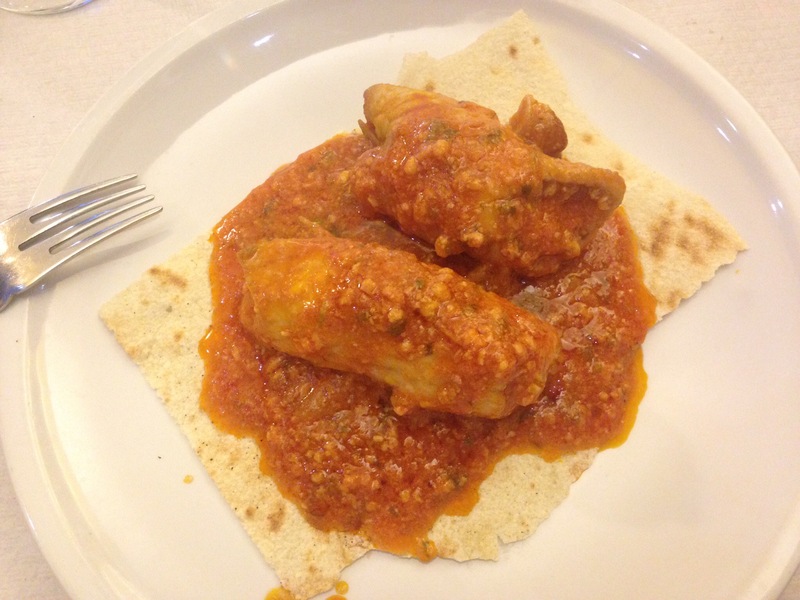 This secondo is a piece of a whole grain carte de musica topped with braised calamari in a red wine sauce. 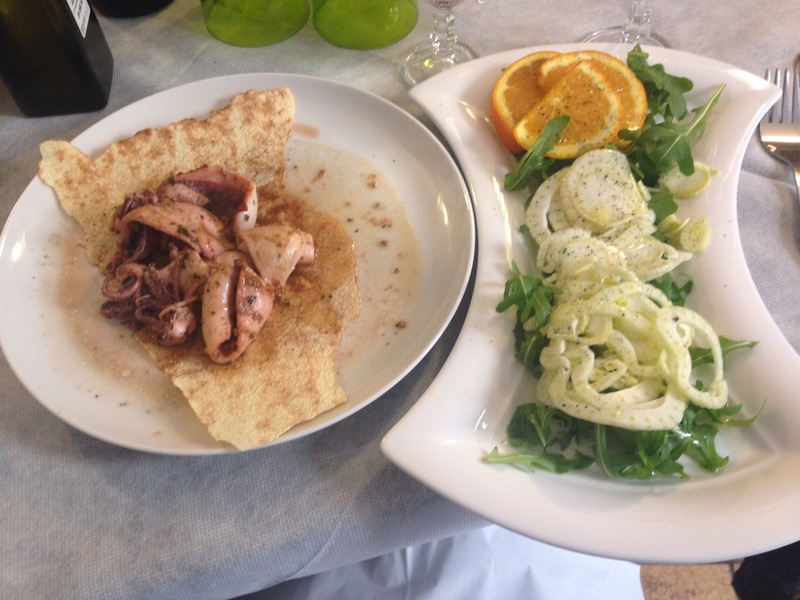 To the side is a fresh salad of arugula, sliced fennel bulb and sliced orange topped with olive oil, salt and pepper! The juice from the orange adds to the marinade. 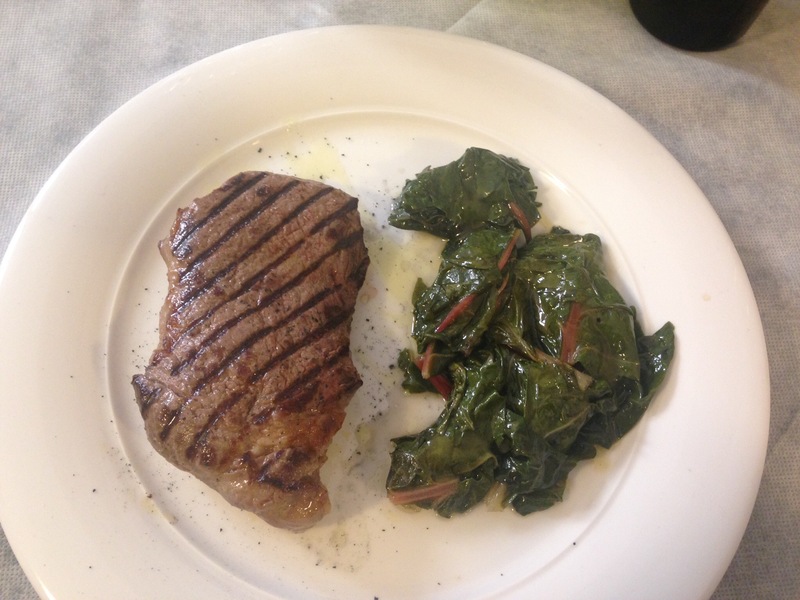 This secondo is a grilled beef steak with steamed Swiss chard. 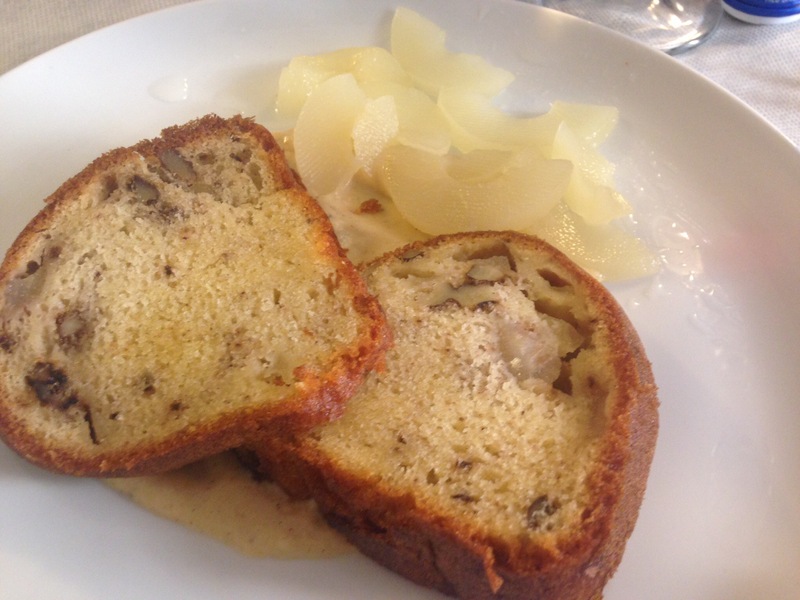 Homemade walnut cake, cream sauce and sliced poached pears. 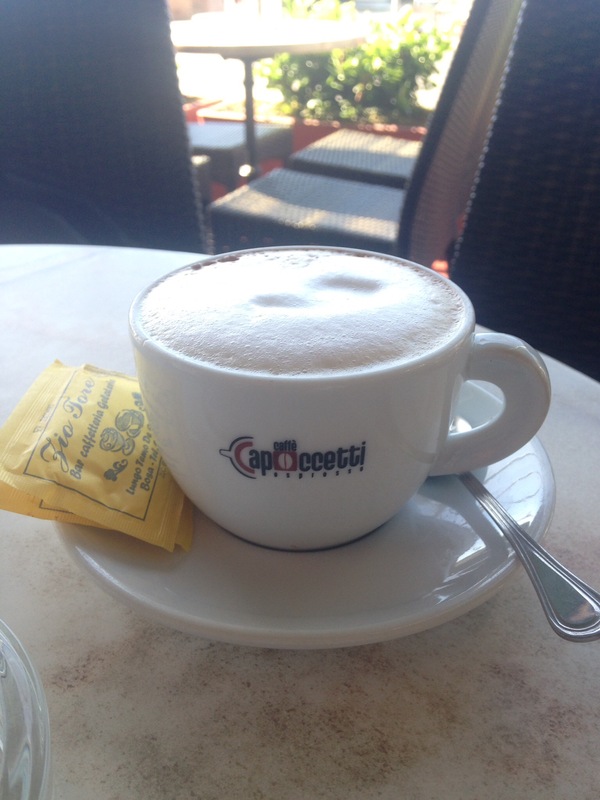 A perfect cappachino now that we are in Italy! Zio Tore Cafe in Bosa, on the river. 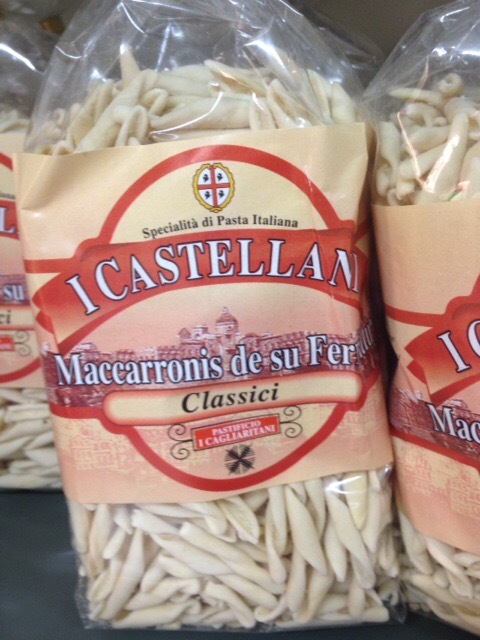 The authentic pasta of Bosa, cagliaritani, dried and below, cooked with a frozen clam sauce added. 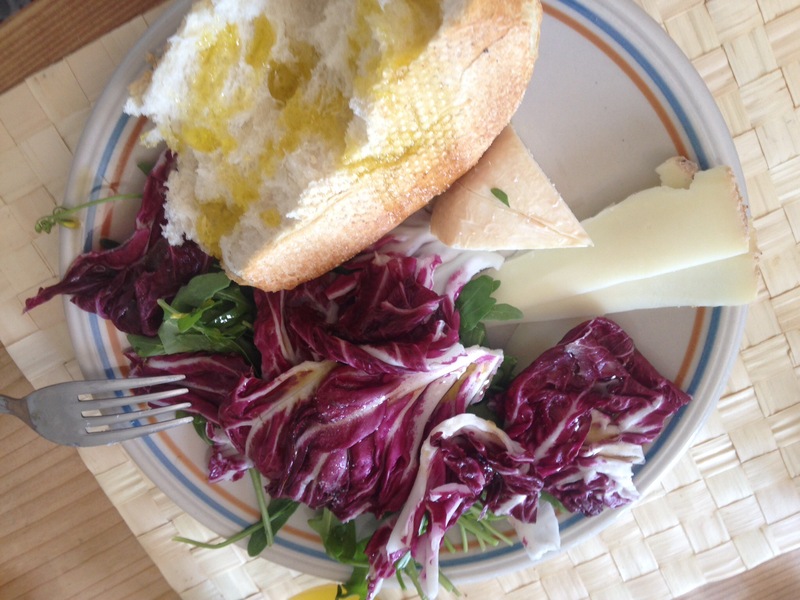 Our typical apartment meal: salad, cheese and bread with olive oil. 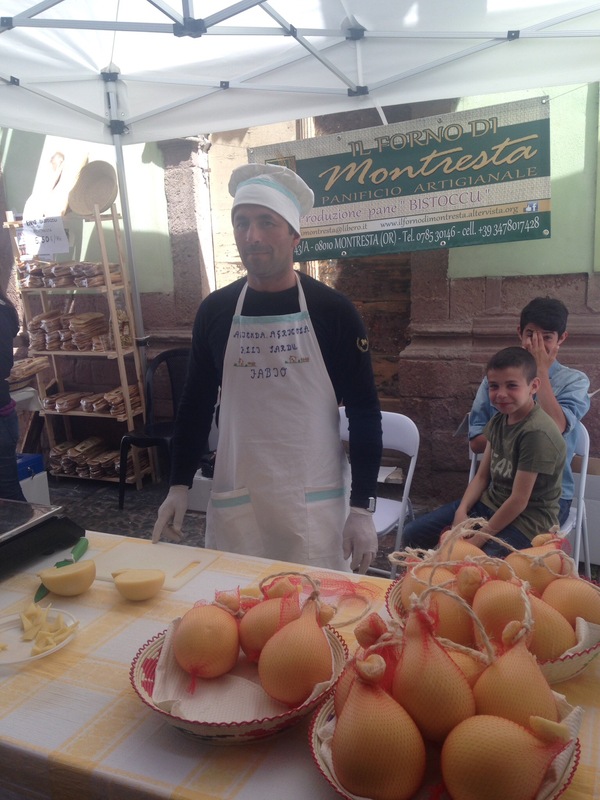 A mild cheese we found at this special market day in Bosa. The cheese is made in the nearby Village of Montresta. 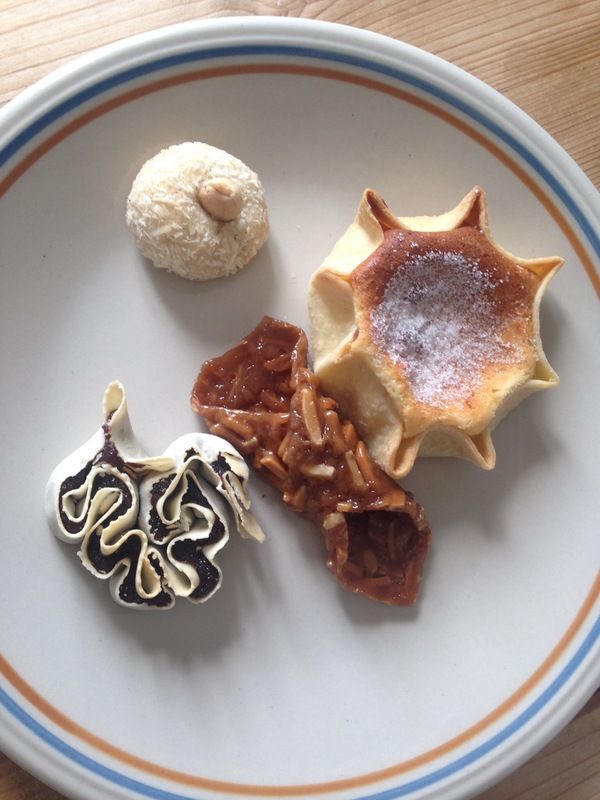 Pastries of Bosa: almond macaroon, custard filled tart, almond with caramel roll and pastry filled with fig. 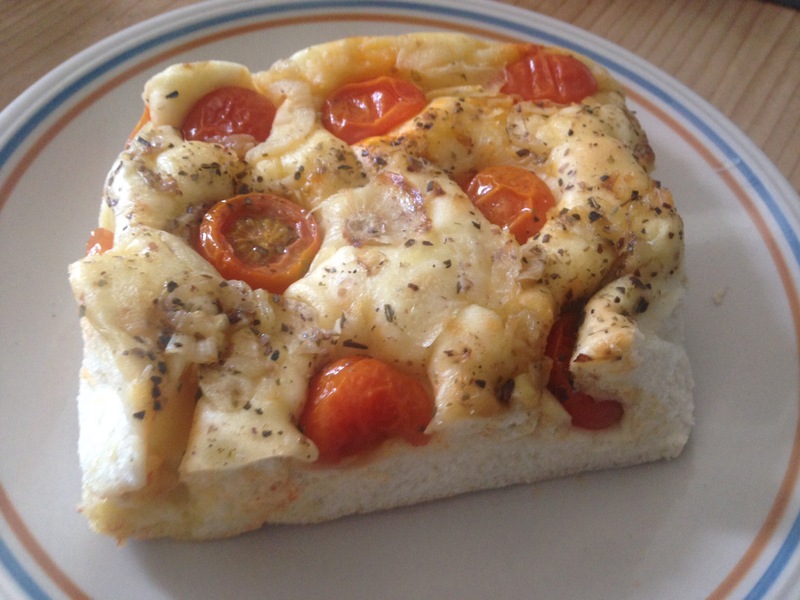 Thick focaccia topped with cherry tomato halves, a slight grating of hard cheese and dried oregano. 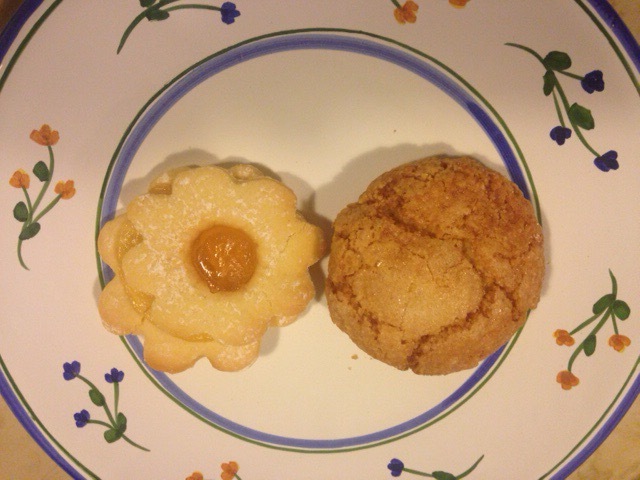 Delicious butter cookies with apricot filling and a crispy and moist almond macroon from a pastry shop only open 2 half days a week in Bosa. 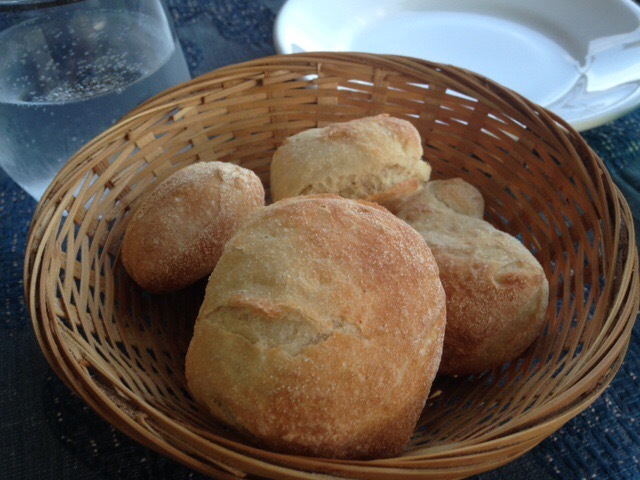 Pillows of cracker like bread similar to carte de musica. 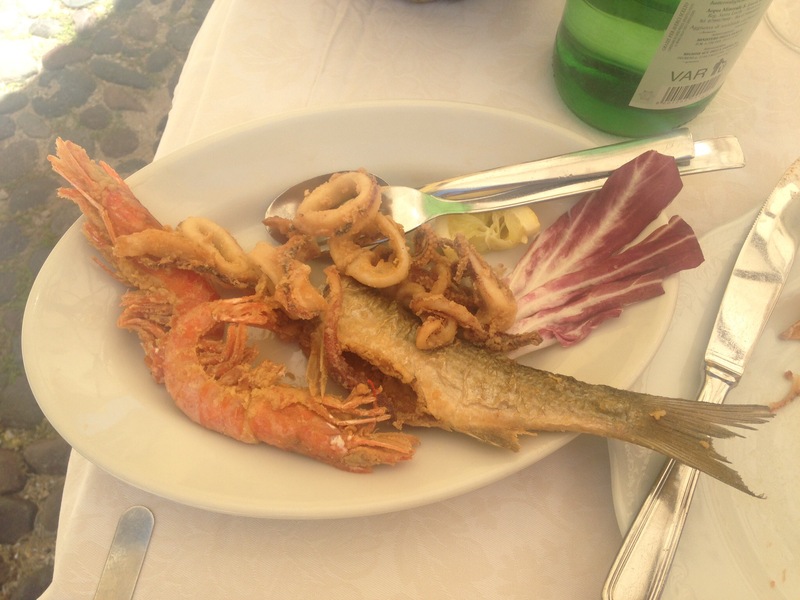 Fried calamari, shrimp and a whole fish at San Ignasio in Bosa. 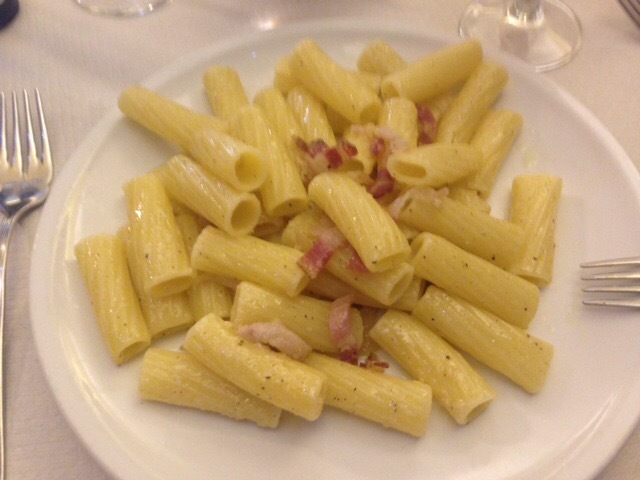 Rigatoni with pancetta, a smokey bacon. 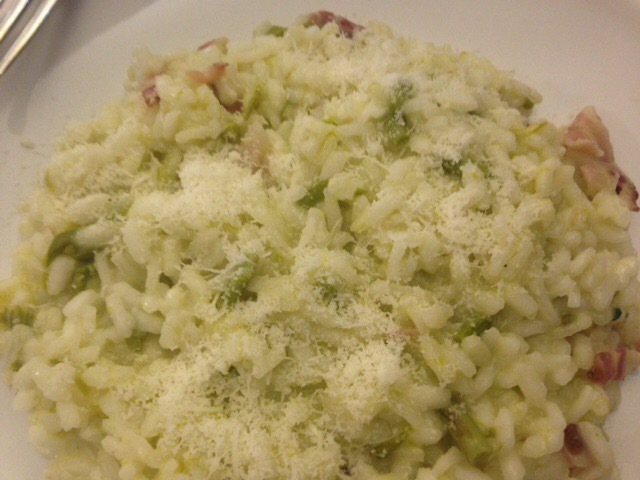 Risotto with asparagus, lemon and pancetta from Mandiga Lestru in Macomer. 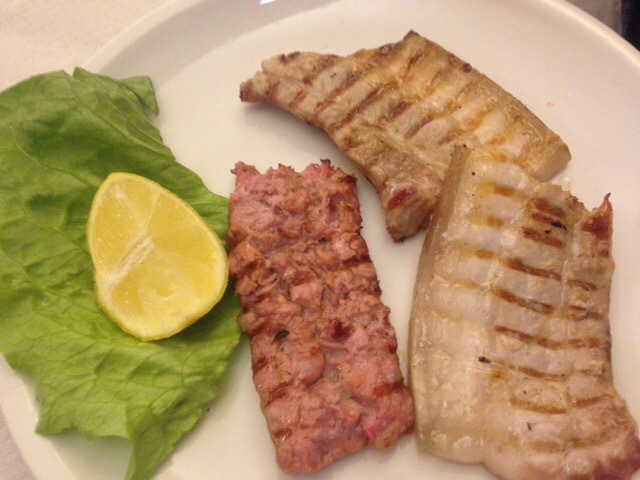 Sausage cut open and pork belly at Mandiga Lestru. 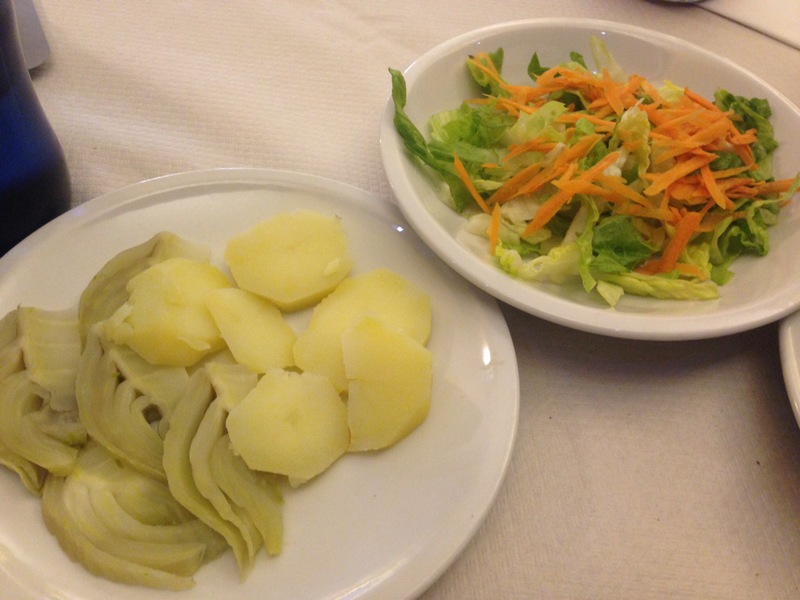 Poached or boiled potatoes and sliced fennel. 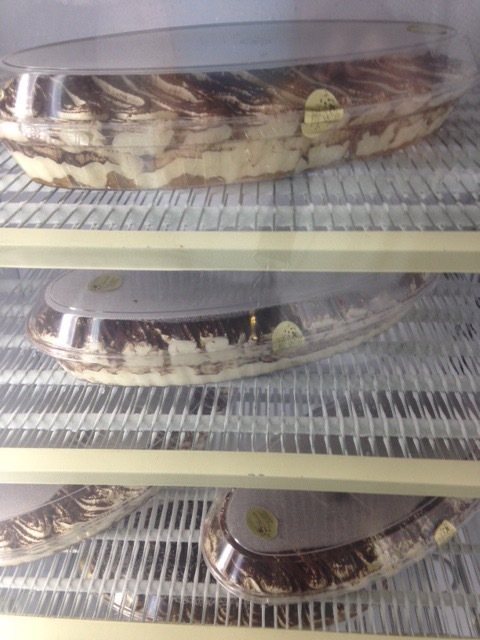 A frig full of tiramisu ready for take out at Mandiga Lestru in Macomer. 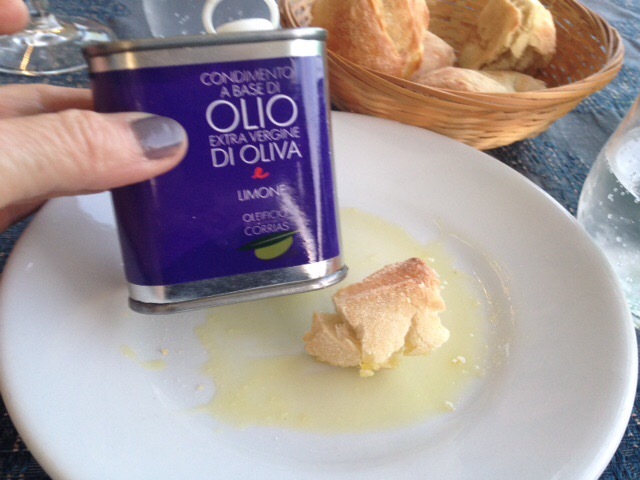 Crispy rolls served with lemon flavored olive oil at Green River or Verde Fiume in Bosa. 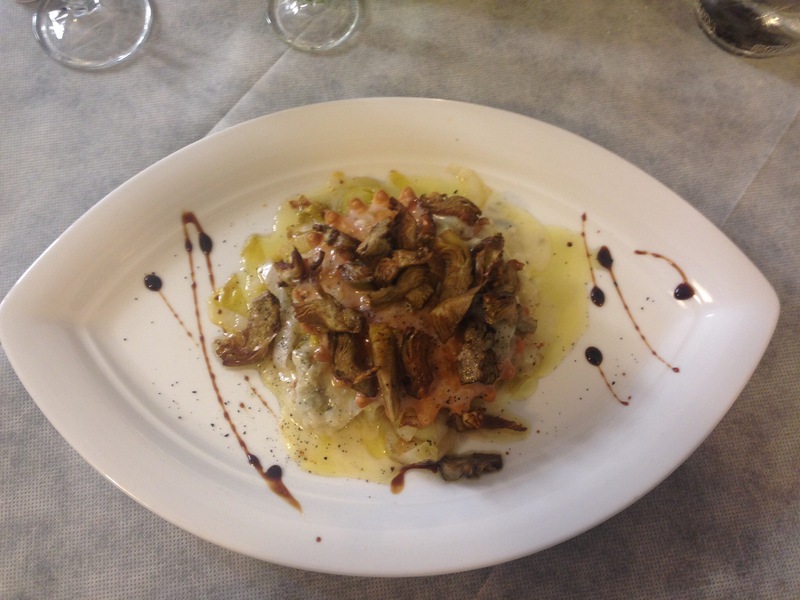 One of the best meals served in a cafe overlooking the river in Bosa. 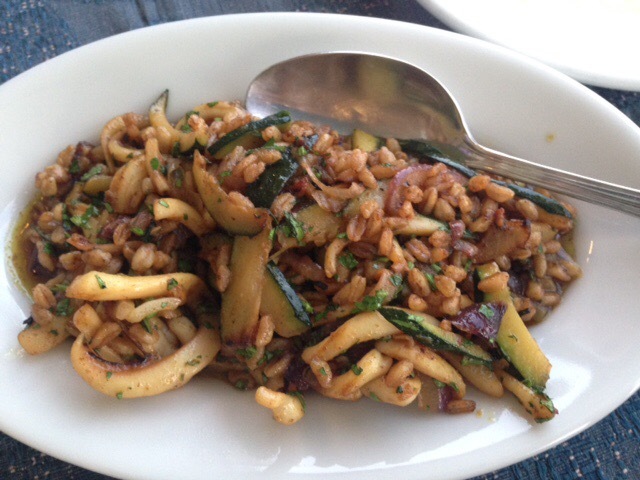 More of our dinner…..
A primo or first course: farro, which seems a lot like barley to me, with zucchini, onion, calamari, curry and parsley. So flavorful! 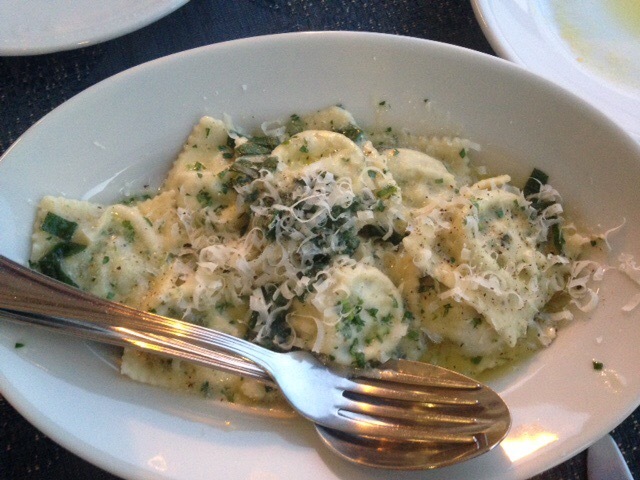 House made ravioli filled with ricotta and spinach with a butter parsley sauce and grated parmigiana cheese. 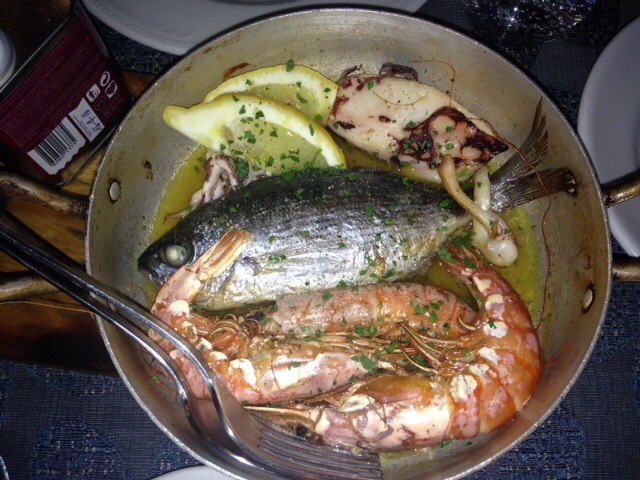 Oven baked shrimp, calamari and a whole fish with lemon and parsley. 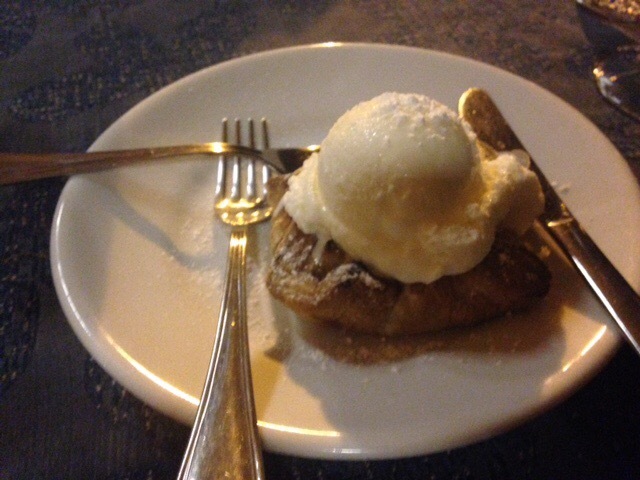 A pie like pastry filled with pear and chocolate and topped with vanilla ice cream. 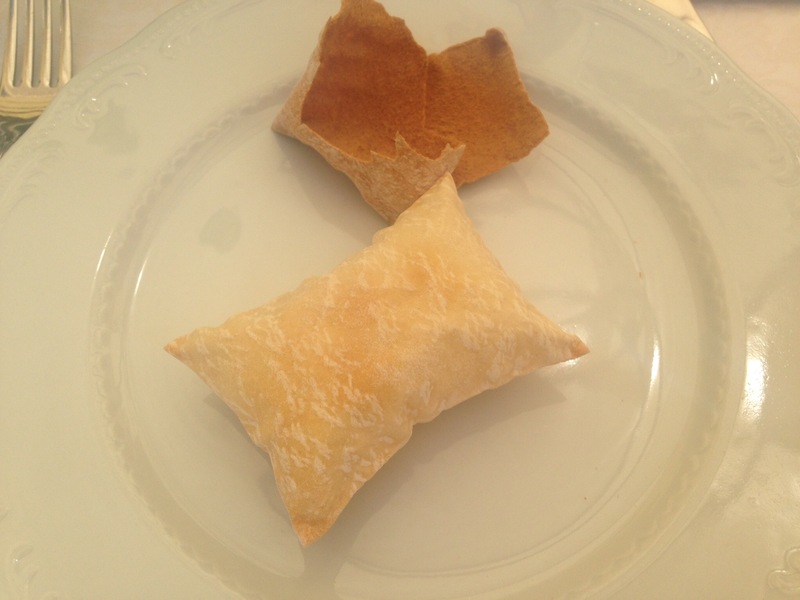 Pizza that is folded after it is baked in squares and strips. 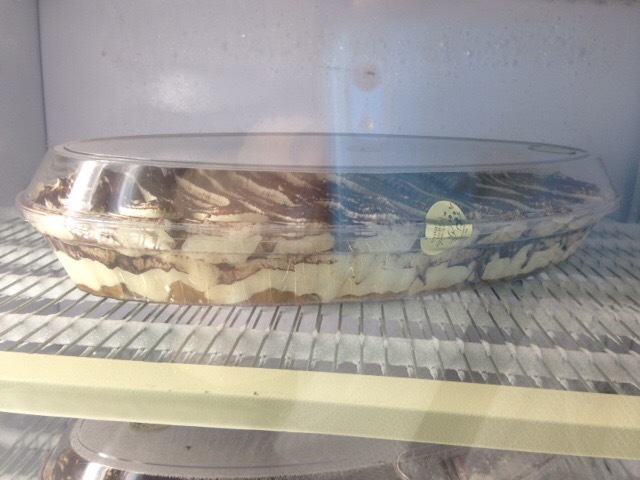 One is filled with 4 cheeses and the other with mushroom, cheese and sausage. Giovanni’s Pizza in Bosa has a cool business model. His shop is take out only, but on both sides of him are bars with outdoor and indoor seating where you can order your drinks and eat his pizza! Evenings the crowds wait out the door for his pizza! 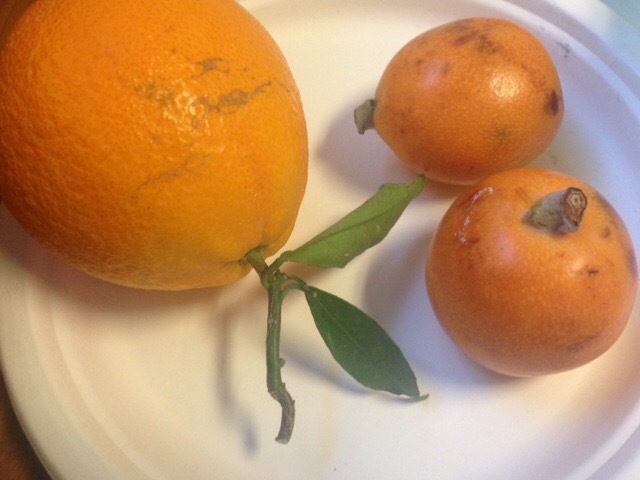 A very moist naval orange here and a fruit new to me. Nespole. The bottom pic show its seeds. Tastes like a citrusy apricot or nectarine. 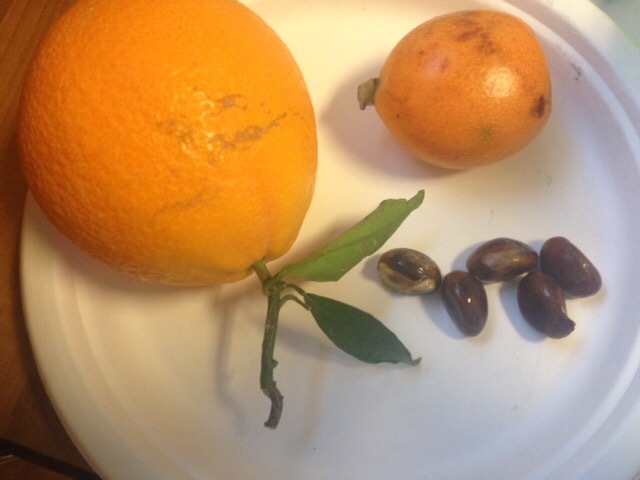 This fruit is blooming all over Sardinia and Sicily. 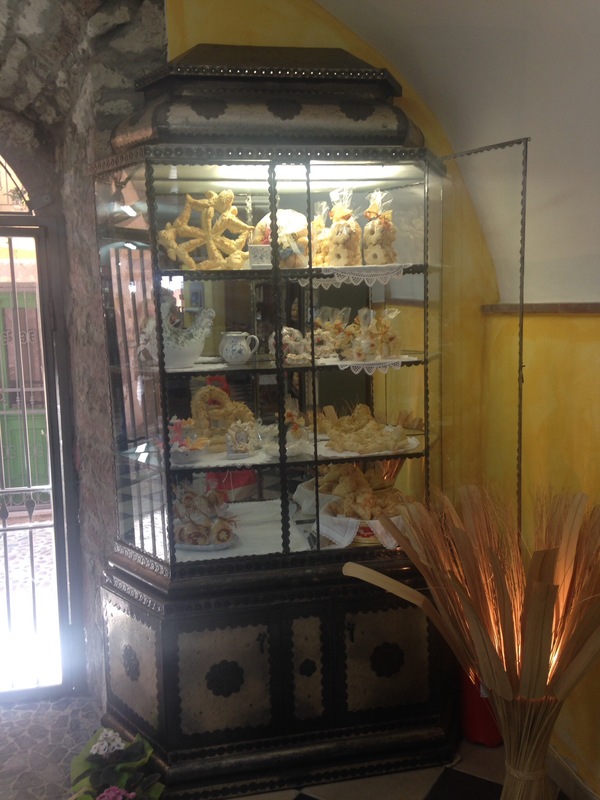 Fancy traditional breads on display in Bosa. 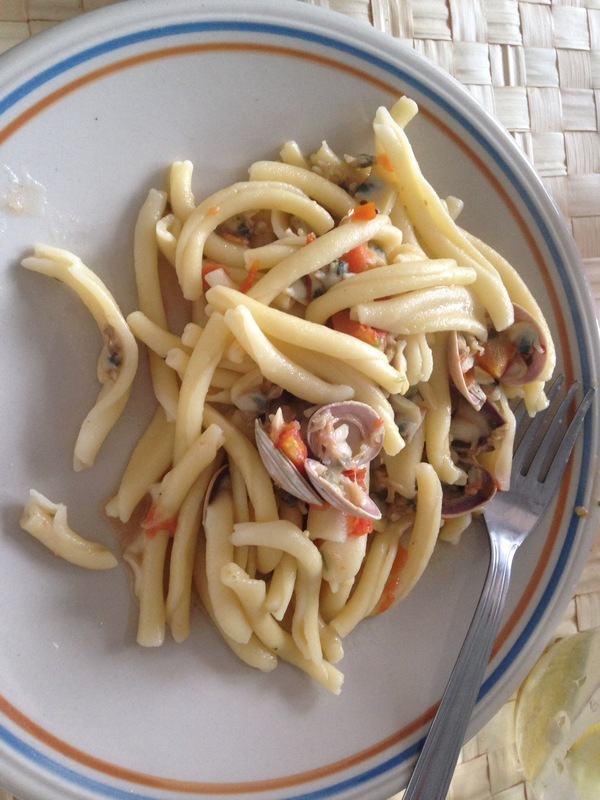 Posted in travel eats and tagged Biancospino Trattoria, bosa, fiume verde, giovannis pizza, macomer, mandiga lestru, sardinia, verde fiume. Bookmark the permalink.